Hamid Karzai was born on December 24, 1957 in an ethnic Popalzai Pashtun tribe in the village of Karz, near Kandahar province Afghanistan. In December 2001 Bonn Conference Germany, Hamid Karzai was selected as the Chairman of the Transitional Administration of Afghanistan. In the 2002 Loya Jirga (Grand Council)Karzai was appointed as the Intrem-president of the Afghan Transitional Administration. Then in 2004 presidential election he won the second term presidency for five years which was ended in August 2009. Moreovere, he liked the presidencey and being the president of Afghanistan for seven years, so he attended again in august 2009 election and campaigned agaist his former foreign minister Dr Abdullah Abduallah. However, the ressault was annouced On October,20,2009 after weeks of investigation about the fraud during the election proccess and Hamed Karzai went to runn off against Abdullah Abduallah. In the second term election which was supposed to be held on November 7th 2009, His opponent Dr Abdullah didn't attend in the election and Karzai was announced as the president of Afghanistan. Karzai was born in an educated family. His father, Abdul Ahad Karzai, was a Popalzai tribal elder and a significant political figure who served as Deputy Speaker of the Parliament during the kingdom of Mohammad Zahir Shah in 1960. Karzai started his school in Kandahar city and then he moved to Kabul to complete his education. From 1979 to 1983, he took a postgraduate course in political science at Himachal Pardesh University in India. After he returned home, he started to work as a fund-raiser for supporting anti-Soviet Mujahideen from the early Soviet invasion until the rest of the 1980s in Afghanistan. 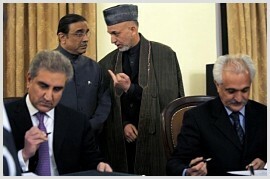 Karzai was also worked as a middle man between the U.S. Central Intelligence Agency (CIA) and the former Mujahideen. Moreover, one of Karzai’s brothers had a close personal contact with former CIA Director William Casey and George H.W.Bush during the Soviet invasion. Karazai’s brothers immigrated to the United States; however, Hamed Karzai remained in Pakistan during the Soviet occupation. After the communist regime of Dr. Najibullah in 1992, Karzai worked as Deputy Foreign Minister in the government of Burhanudin Rabani. When the Taliban emerged in the 1990s, Karzai was at first one of their supporters but later he broke with them and refused to serve as their U.N ambassador. While Hamid Karzai was living in exile in Quetta Pakistan, his father Abdul Ahad Karzai was assassinated by the Taliban on July 1999. In the beginning of 2001 Hamid Karzai worked closely with the leader of Northern Alliance Ahmad Shah Masoud to help gather support for the anti-Taliban movement. When the 9/11 attack happened in New York and Washington, the US led NATO forces with Northern Alliance bombarded the Taliban shelters until their regime overthrew. 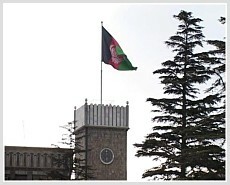 Afghanistan flag was adopted in 2002 by President Karzai in three vertical color stripes similar to Afghanistan flag during Zahir Khan's kingdom. 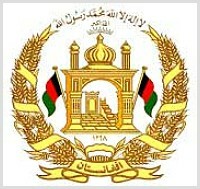 However, Karzai added the deceleration of Shahadah above the two sides of wheat branches on top of the emblem. Afghanistan flag represents the long history of Afghanistan.